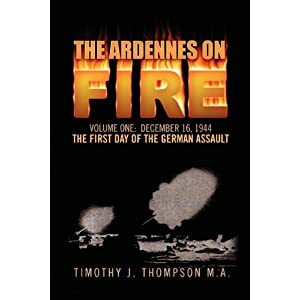 There have been many books written on the Battle Of The Bulge, but none of them goes into the detail that, The Ardennes On Fire: Volume One does. This amazing book outlines every single aspect of the gigantic German military buildup in the Eifel, compares and contrasts the weaponry on each side, and then pits the German and American forces against one another all throughout day one of the legendary and infamous Battle Of The Bulge. This book is a must read for any World War Two buff or military historian. It is the type of book that you will never be able to put down, and will find yourself reading over and over again with ever increasing enthusiasm. If you love reading about the Second World War, then The Ardennes On Fire: Volume One, is the perfect book for you! A WORLD WAR TWO THRILLER!! ADOLF HITLER'S GREATEST MILITARY GAMBLE! BRAND NEW, STATE OF THE ART, PANTHER TANKS DETRAIN IN THE EIFEL IN LATE OCTOBER 1944, AND A MASSIVE KING TIGER TANK PASSING THROUGH TONDORF, GERMANY ON DECEMBER 16 1944. THEY WERE TWO OF THE GREATEST BATTLE TANKS EVER PRODUCED IN THE HISTORY OF WARFARE. EVEN BY TODAY'S STANDARDS, THEY WOULD PROBABLY BE VERY GOOD WEAPONS. THAT GIVES YOU A LITTLE IDEA OF JUST HOW POWERFUL AND TECHNOLOGICALLY ADVANCED THEY WERE FOR THEIR TIME. 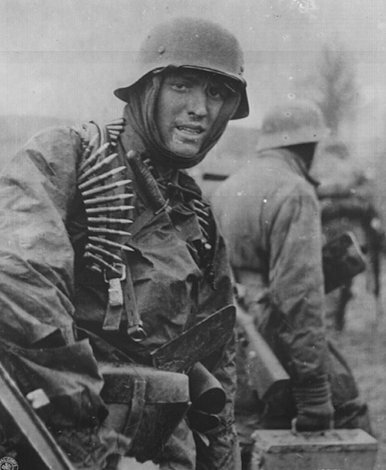 A famous photograph of a heavily armed and confident German Panzer Grenadier during the great Ardennes counter offensive of 1944. 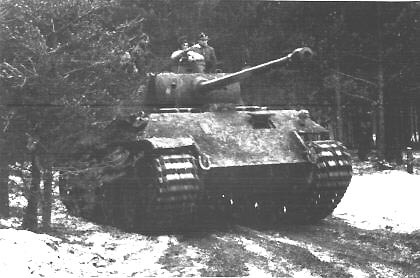 And, a handsome photo of a sleek and powerful Panther Tank of the Fifth Panzer Army taking up a bombardment position in the late afternoon of December 15 1944. The imposing and sloped frontal armor of the Panther Tank was capable of deflecting most any shell in the Allied arsenal; one of the countless things that made the Panther Tank one of the greatest and most feared weapons in the history of warfare. DETAILED MAP SHOWING MAXIMUM GERMAN PENETRATION DURING THEIR GREAT ARDENNES COUNTER OFFENSIVE OF LATE 1944. AT THEIR MOST EXTREME SPEARHEAD, THE GERMANS MANAGED TO ADVANCE ABOUT 53 MILES DEEP INTO UNITED STATES LINES. Thank you very much for visiting my website! Have a great day and stay safe. Please come back and visit again!